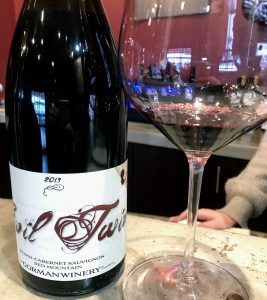 A few quick thoughts on the 2013 Gorman Evil Twin Syrah-Cabernet Sauvignon blend from Red Mountain. Chris Gorman started in the wine industry right after college working for an Italian importer. Here he developed a passion for wine, particularly the “iron fist in a velvet glove” sensations of Barolo and Barbaresco. Wanting to try his hands at winemaking, he convinced Scott Williams of Kiona Vineyards on Red Mountain to let him have some fruit. The first commercial release of Gorman was in 2002, focusing on the then newly minted AVA of Red Mountain. Today, Gorman is still a relatively small operation with Chris Gorman and assistant winemaker Ben Paplow producing less than 8000 cases. The name “Evil Twin” comes the Fender twin guitar amp and pays homage to Gorman’s love of music. The 2013 example is a blend of 75% Syrah and 25% Cabernet Sauvignon. The wine was barrel fermented and aged 20-21 months in new French oak with around 400 cases made. It’s 100% Red Mountain fruit and while I couldn’t find the exact vineyards for this wine, Gorman sources from several of the top vineyards on Red Mountain including Kiona, Klipsun, Ciel du Cheval, Obelisco, Quintessence and Shaw. High intensity nose-a mix of black fruits and savory, meaty notes followed by spicy black pepper and cumin. Rich dark fruits characterize this wine. On the palate those dark fruits carry through and become more defined as blackberry and black plums. HUGE mouthfeel. Very full-bodied with medium-plus tannins that you feel like you could literally chew on. However, this wine also has ample medium-plus acidity to balance it. Those savory, spicy notes return for a long finish. In some ways, Gorman kind of hits that “iron fist in a velvet glove” quality with his Evil Twin. Quite different than the context of Barolo, instead it punches you with an iron fist of big fruit before seducing you with complex layers of savory flavors and spice that adds velvet nuances. At $60-66, it is a very bold and characterful Washington wine that is worth finding. Tagged Barberesco, Barolo, Ben Paplow, Cabernet Sauvignon, Chris Gorman, Ciel du Cheval, Gorman Winery, Kiona Vineyard, Klipsun, Obelisco, Quintessence Vineyard, Red Mountain, Scott Williams, Shaw Vineyard, Syrah.